Waters Corporation is a global operation that designs, manufactures, sells and services precision analytical technologies, such as liquid chromatography (LC), mass spectrometry (MS) and thermal analysis. The company is regarded as a technology innovator, a premium supplier and one of the largest companies in the analytical-instruments industry. At its headquarters in Milford, Mass., it is developing high-performance liquid chromatography (HPLC) equipment used in the pharmaceutical, food, cosmetics and fragrances, environmental, forensics, clinical and industrial-chemicals industries. The trend toward small-particle chromatography has led Waters to research and develop instruments with a smaller internal volume and higher pressure. These instruments, known as ultra-performance LC (UPLC) systems, are far more sensitive and efficient than their predecessors, and they generate more information in less time on much smaller sample sizes. As Waters R&D moves chromatography to routine micro scale and beyond, it relies on its machine shop to turn out its prototypes quickly so that it can determine if the company is on track to manufacturing a promising new product. In the development of a recent product, Waters sought to produce a series of micro-fluidic channels in a fully contained metal device with features measuring 0.0060-inch wide and 0.0070-inch deep, and surface finishes of 5-micro-inch Ra. To achieve these results, the company began researching micromachining centers that would enable production of both large and small features on the same machine, ensuring that critical accuracies in other features are held precisely in relation to the micro-fluidic channels. Outsourcing was not an option, due to compressed product-development cycles and requirements for short lead-times. Waters had visited Makino during IMTS, which led the company to contact Makino about this application. The company soon sent its part specifications and then traveled to Makino’s Auburn Hills (Michigan) Technology Center to see the equipment in action. Within a short time, Makino’s research and development team at Auburn Hills was manufacturing Waters’ parts on an iQ300 vertical machining center, overcoming the limitations experienced with the company’s previous equipment. With results proven and engineering support validated, Waters purchased the iQ300 for its most precise micromachining challenges. Since investing in the iQ300, Waters has been able to meet all of its critical tolerances, producing the micro-fluidic channels with exceptional repeatability and reliability. Accuracy and precision are maintained, whether a part runs for four to five minutes or four to five hours. Waters is now using tooling as small as 0.0030 inch in diameter, without any issues of breakage or limited tool life. The machine’s ability to adjust positioning within increments of 0.00001 inch has enabled Waters to maintain a 0.00005-inch true position in critical hole features relative to the micro-fluidic channels. The company has more than met its 5-micro-inch Ra surface finish requirements, achieving finishes ranging between 1- and 2-micro-inch Ra regularly. 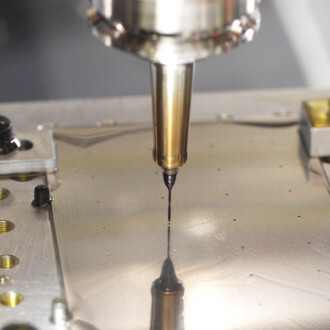 With the ability to perform ultra-precision micromachining in-house to validate its R&D engineering, Waters has expedited its product development and time to market, making new innovations possible much more quickly.